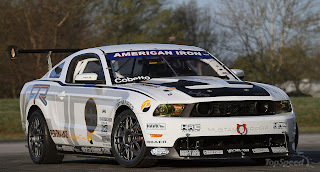 Ford Racing opened up the 2010 Mustang Cobra Jet build facility to customers, vendors, partners and employees to celebrate the “Job Done”, the completion of 50 new Cobra Jets. Seventeen Cobra Jet customers made the trek to snowy Flat Rock, Michigan to pick up their factory built race cars. While at the Mustang plant, the new owners had the opportunity to meet the employees that built the cars and help celebrate the life of the Cobra Jet’s founding father, the late Bob Tasca. Bob Tasca, Jr stopped by to participate in the celebration as he was on his way to Pomona to race his Mustang Nitro Funny Car at the NHRA Winternationals. Tasca, Jr. recalled how his grandfather and his dealership mechanics helped create the first Cobra Jet prototype. Bob Tasca, Jr. stopped by on his route to Pomona to thanks those that participated in the Cobra Jet progam, a car his late grandfather Bob Tasca created. Brent Hajek was the lucky recipient of the first 2010 Cobra Jet off the assembly line. If you’re not familiar with Hajek, he’s what I call a modern day version of Mickey Thompson. He was the car owner of John Calvert’s 2009 Winternationals winning Cobra Jet and has been to Bonneville with Mickey’s son Danny Thompson driving a Mustang to 250+ mph. He even coaxed Bill Elliott back to Talladega to attempt a closed course record in an E-85 powered late model Mustang. Hajek took delivery of the first 2008 Cobra Jet and bought several more. He was excited to take delivery of the first 2010 Super Cobra Jet and has big plans for the new year. Brent Hajek was the lucky recipient of the first 2010 Cobra Jet off the assembly line. He he accepts the keys from Ford Racing's Andy Slankard. Randy “Mr. Big Stuff” Payne made the trip north to pick up his car. In 1969, Payne teamed up with Herbert Platt to run Ford’s Eastern Ford Drag Team. Another 2010 Cobra Jet owner making the trek to Michigan was Rome, Georgia’s Randy “Mr. Big Stuff” Payne. In 1969, Payne teamed up with Herbert Platt to run Ford’s Eastern Ford Drag Team. 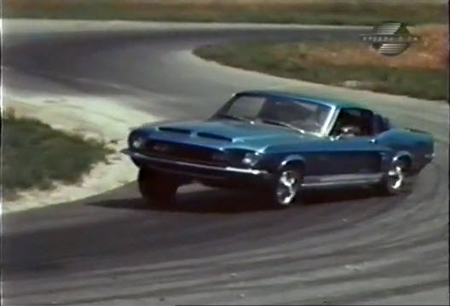 Platt and Payne hit the road in a two car open hauler with Platt's CJ powered Mustang and Payne's Torino Cobra Super Stocker. Back in 1969, the team ran a heavy schedule of drag racing events and held performance clinics at local Ford dealerships. Randy’s son Butch still races in NHRA’s Stock Eliminator and the family was excited about picking up the car and getting back to Georgia. The Payne’s even brought some of the old photos from the Ford Drag Team Days and displayed them next to their new car. Another tried and true Ford family taking delivery of a 2010 Cobra Jet was Grace Howell and the Howell family from Aiken, South Carolina. For several years, Grace campaigned a 1995 Cobra R in NHRA’s Super Stock class. Plans for 2010 include running the Cobra Jet in AA/SA and the Cobra R again in the Super Stock GT class. The Howell team plans on running both cars first at the NHRA Gatornationals and in other races in the Southeast and Midwest. Jamie Allison (far right) Brian Wolfe (second from right) and other members of AAI and Ford Racing sign a Cobra Jet hood that will go up on the pilot assembly wall of fame. Jamie Allison, director, Ford North America Motorsports was on hand to congratulate his Ford Racing team that helped make the 2010 Cobra Jet a reality. As head of Ford Racing Performance Parts last year, Jamie was instrumental in making the additional run of 50 2010 Cobra Jets happen. Also on hand was Brian Wolfe, who was head of Ford Racing last year when the 2010 Cobra Jet was designed and developed. Credit goes to Brian for many of the racer friendly features on the new car. Features that include; transmission access panel, engine/transmission options and other go fast goodies. This entry was written by by Andrew Casselberry (Stang TV Forums) and posted here on Wednesday, February 10th, 2010 at 6:09 pm and is filed under Vintage Mustangs. This article was not written by us, rather gathered using RSS feeds listed here. We take no credit for this article. Both comments and pings are currently closed.